Smart move. Pinterest is a long-term source of quality website traffic. Unlike other social media posts, Pinterest pins can reappear in the Pinterest feed for months – even over a year. I’m still getting floods of traffic to a blog post that was first pinned in January 2016. Pinterest is my absolute favorite social media platform – even if it is more of a search engine than a social platform. 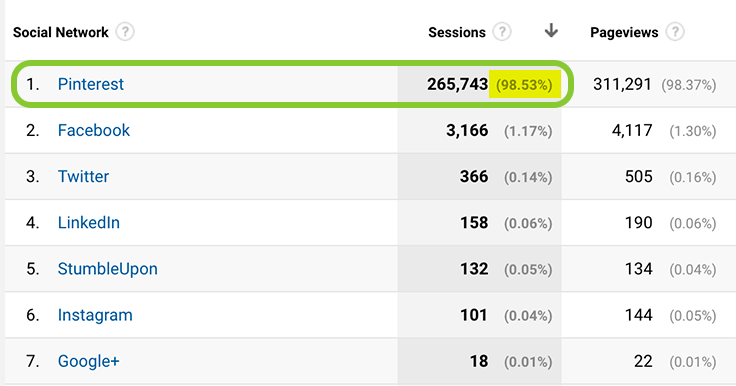 On my “worst” month, I get 10x more web traffic from Pinterest than the others combined. January 2017 social media referral traffic to LouiseM.com. 98.53% Pinterest! In my best month (November 2016), I got 172 times the traffic! 649,913 clicks to LouiseM.com from Pinterest. 3,768 total from Facebook, Twitter, Instagram, LinkedIn, and Google+. And Pinterest is single-handedly responsible for my traffic growth the first 20 weeks of 2017 over the same period in 2016. Top chart is Pinterest, bottom chart is all traffic. Each compares 2016 and 2017. All growth due to Pinterest! Yet I don’t write much about Pinterest because – it seems so easy! But I’m gonna share my secret weapon with you today. And it’s why being a success on Pinterest is so easy. 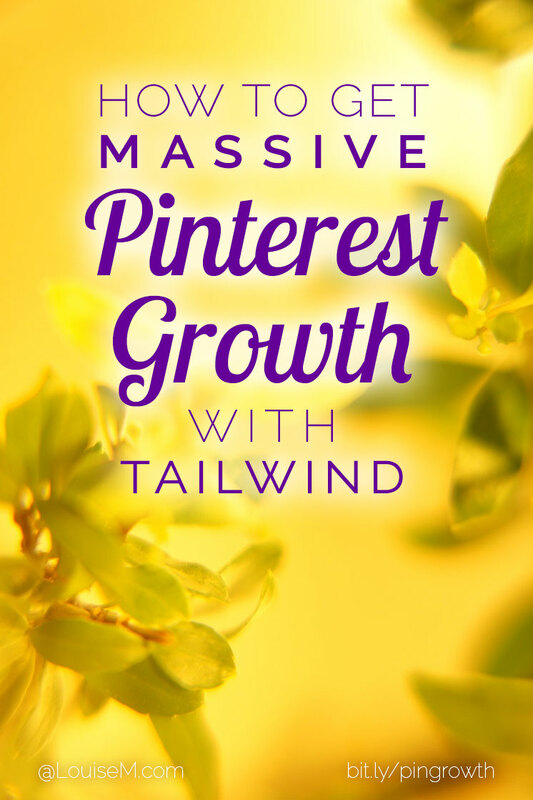 It’s a Pinterest scheduler called Tailwind. I hold it largely responsible for tripling my followers over the past year (4.9K –> 15K+), and increasing my monthly Pinterest referral traffic by over 50 times. Because all I do on Pinterest to get these results is – just keep pinning! Which is fast and easy with Tailwind. Note: You can try Tailwind FREE for 30 days with my link. If you decide you love it, it’s $10 per month when you pay for a year in advance ($119), or $15 paid monthly. I’ll get a small bonus for referring you if you do. This lesson comes from my NEW Pinterest 101 course. Check it out after reading! With Tailwind, you can sit down once a week and schedule 100 pins before you know it. 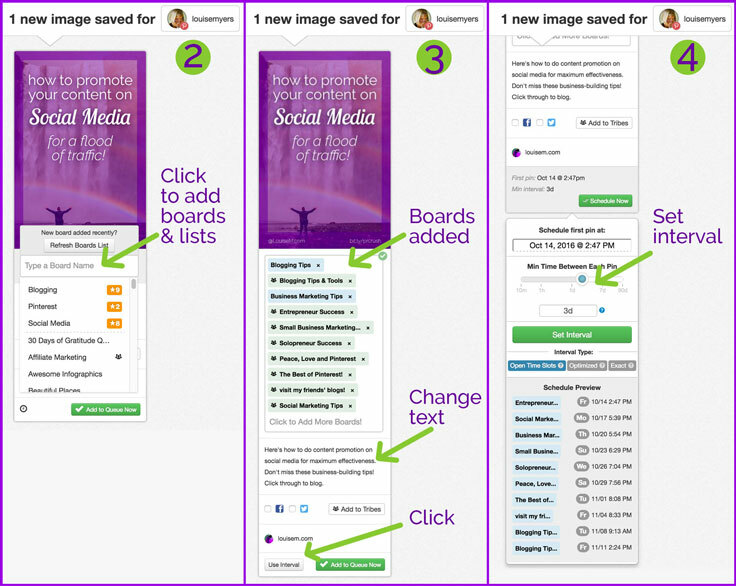 The secret is in pinning your own content to multiple boards. You simply set the minimum interval you want that Pin to be posted, and Tailwind spaces out the repeats into the appropriate time slots. They even determine your best times to Pin! You need to have multiple Pinterest boards appropriate to your business in order to make best use of Pinterest’s power. One board for all your own blog posts. 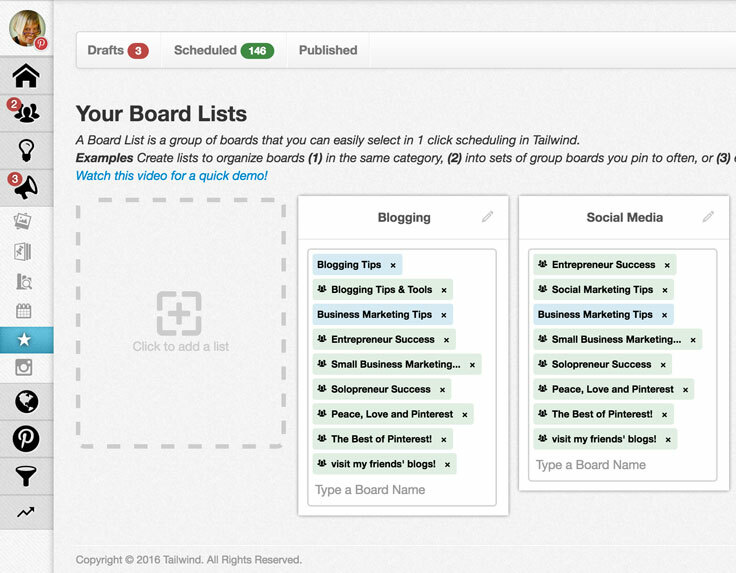 One board for each of your main blog categories and/or product categories. More boards for your subcategories (take a look at your blog “tags” for ideas). And, quality group boards pertinent to your blog and business. Next, create Board Lists in Tailwind. You’ll find this feature under the Publish icon. Create a list for each of your main blog topics. Mine are Blogging and Social Media. Add all appropriate boards to each list you create. P.S. I now have 7 board lists, with more personal boards, and fewer group boards. Pinterest board lists for fast scheduling. 1. Go to pin or repin as usual, but click the Tailwind Schedule button. 2. Assign the Pin to your Board Lists and/or individual boards. For this one, I used both my Blog and Social Media board lists. Note that Tailwind eliminated duplicates. 3. Change the Pin Description now if you wish. Then click the Use Interval button. 4. Set an interval to space out the Pins of this same image. You can use the slider, or type in a number. Then click the Set Interval button. I pin about 12 times a day, so every 3 days spaces them out enough for me. If you pin less often, space them by more days. This is just to prevent seeing repeats close together, if people look at your Recent Pins page. 5. Click Schedule and you’re done! Tailwind will place the pins into the next available slots on your schedule, at the interval you specified. There’s so much more to Tailwind, but this will get you off to a fast start! For more tips, view these excellent tutorials from Angie Gensler. This one shows how TailWind’s SmartScheduler works – when you’re ready to add more time slots. Don’t even worry about pinning more than 30 times per day, as there are no benefits to pinning more than that. Start with 5 and build from there. Below, how to use the Chrome extension to repin top content from Pinterest (10 minutes). To sign up for a free TailWind trial, click here. You can schedule 100 Pins! Cost after trial: $9.99 per month, paid annually, or $15 paid monthly. 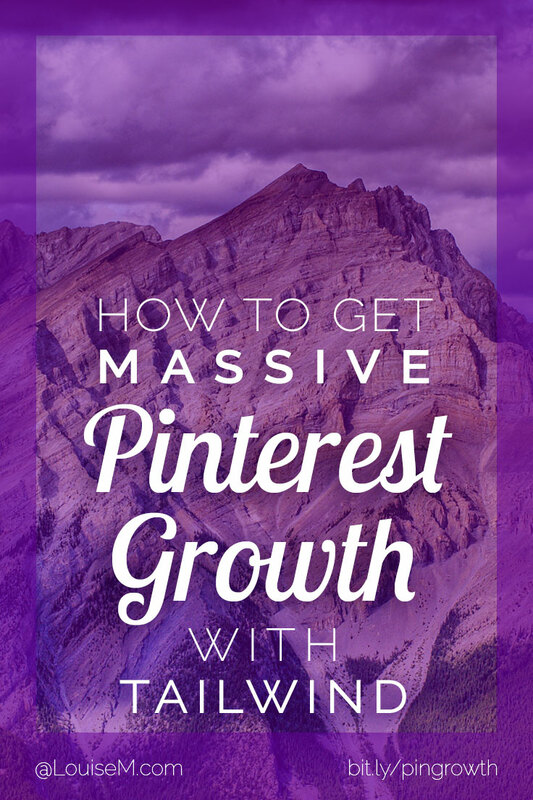 Pin this post so others can enjoy Pinterest growth too! Hi Louise, thanks for this great post! I was looking for info about the interval button and tadaaa 🙂 I do have another question: do you schedule your pins from your blog (aka you use your own pin it button in your posts), or do you upload your pins into tailwind? If you upload them, how can you make them rich pins? Hope you can help me! Thanks in advance! You can pin them and schedule from your Pinterest board, you can install the Tailwind extension and schedule directly from any website, or you can upload them. I haven’t tried that, but pins uploaded to Pinterest retain the Rich Pin feature as long as linked to a Rich Pin enabled site. 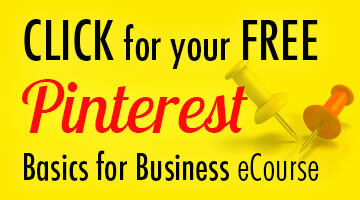 I pin on Pinterest to generate interest and traffic to my Etsy site. Does it make sense for me to sign up with Tailwind? From what I’m reading it appears to be more for bloggers. 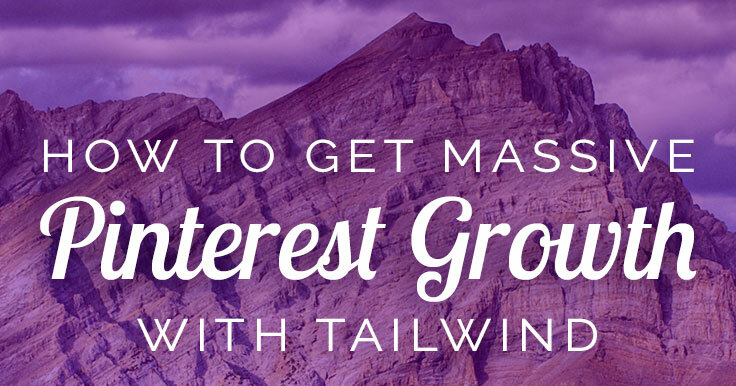 If you use Pinterest for your Etsy store, Tailwind is sure to save you time, and keep your pins circulating. If you don’t have many pins yet, or boards to pin to, then you probably don’t need TW yet. Hi Louise! I appreciate the helpful post. I have a question regarding pinning. Do you only pin your own pins or do you also pin other user’s pins? I ask because from my understanding, Pinterest likes to see users pin the content of others as well as their own. What are your suggestions in this regard? I don’t really know where that thought came from (it’s definitely pervasive tho). My suggestion is to pin others’ content that performs at least as well or better than your own. Pinterest likes to see that you share high quality content that gets saves and clicks. I now pin less than 5% of others’ content. But I do not recommend this for accounts that need to get established as a quality resource, or that don’t have a lot of their own content. Awesome article Louise! I didn’t realize you could set intervals within the Tailwind scheduler popup. Thanks for the tips! Interval scheduling is a lifesaver. I had to edit your comment bc I don’t allow keywords instead of names, or deep linking. So what are you using to create the Pins in the first place? Try these design tools for non-designers. How many of my OWN pins should I have before I begin to use Tailwind? If you want to automate and start growing your Pinterest account, you honestly could start with little or no content of your own. Find top-quality, viral content in your niche to Pin. This will start building your authority with Pinterest, and your followers. That said, you might wait until you have 4 to 7 different URLs that you have pins for. Then you could schedule each to at least 4 different relevant boards. Space out your pins to those URLs so you have no more than 1-2 pins to the same URL each week. After a month or more, you can repeat the same process. I recommend not sharing the same pin to the same board more than once per month (or more). I’m trying to get into Pinterest more for my website, and I keep getting stuck on the same thing–perhaps you can help me? I’m very confused about the pinning and repinning. Are you pinning the same pin to your board over and over? I know you sail Tailwind eliminates duplicates, but I’m confused as to where you should pin these to if you only have 7 boards, how are you preventing duplicates? Tailwind does not eliminate duplicate pins. They eliminate duplicate boards in board lists added to a pin. After your round of pinning to all relevant boards is finished, you can start another round to the same boards. It’s recommended to wait 30 days between pinning the same pin to the same board. Pinterest has confirmed it’s not necessary or desirable to remove duplicates. Or it’s much easier to just use Tailwind SmartLoop and let it determine the intervals for your pins to post again and again. Thanks! That clears it up for me.